Range Rover P38 Blower Module Servicing and Repair – Part 1, Theory, Teardown and Motor Check. Anyone who knows these cars and is trying to keep one on the road will sooner or later run into HEVAC problems. These seem to stem from the blend motors or the blower modules as a rule. As I have a spare one and a dead one on the car I decided to take the spare and totally overhaul it and try and see what actually fails on these as well as document how they work. As with a number of modern cars these modules aren’t simply motors but contain some electronics too. Having dug deep in these Rover did some good work but were possibly constrained by what they had to work with, this seems to be the source of the issues. Simpler cars simply use a multi position switch to feed a series of power resistors, these give you your different fan speeds. 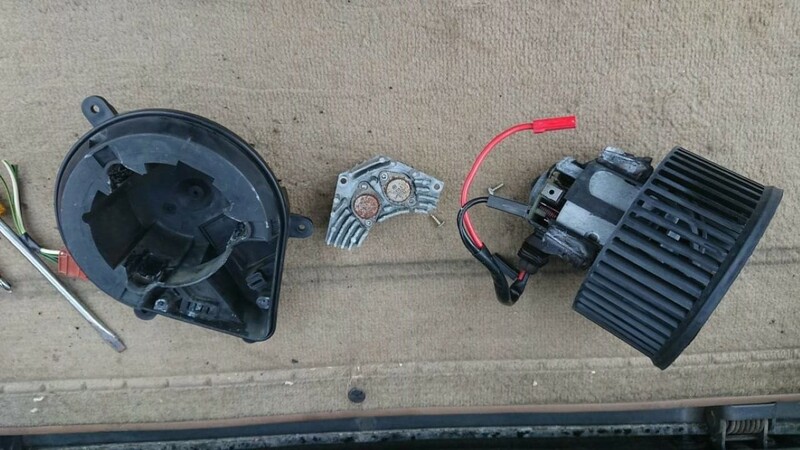 These resisters can and do fail, as do the switches and this can cause loss of speed settings, the whole fan and in some cases (Looking at you here Vauxhall) spontaneous combustion of the air box. When you are looking at a climate control system you need to control the speed of the fan via a computer of some sort, switching relays and transistors can be done to use the resistor system but its simpler and more precise to use something called PWM. Here instead of a simple on/off signal we use a transistor as a switch to control the power to the motor. If we then switch the transistor quickly you can control the speed of the motor by how long the signal stays on. At a basic level you now have 255 speed settings vs 4 or 5 and the computer in the HEVAC can manage it electronically. Most systems them mount the switching transistors on the motor assembly. Modern cars use the same system for engine fans and all sorts of other systems. You supply the fan with power and a switching signal and everything is normally cooled by the fan too. All the big heater resistors are redundant and controlling two fans for dual zone climate control as the P38 uses is much easier. It means there’s no heavy duty switching going on in the ECU (HEVAC Panel) so that can be smaller and integrated with the controls. Now, The P38 system was advanced at the time but they did make some curious design decisions and were limited by the parts they had to use. A lot of P38 electrical gremlins come from the same source, bleeding edge design that was close to what was practical at the time. Either blower comes out easy enough. The procedure is covered elsewhere and I won’t go into it. It does work a little easier on the V8 if you drop the Cruise relay and the ECU that’s with it off the bracket. You get more space. There are a few known issues. The most common is a simply dead unit, in which case you *could* likely swap just the electronics from a known good unit and snap it all back together. However I feel there may be other things at play here. Previous PostZBD EPOP Blade-C E-Ink Displays – Part 2 1/2 – Custom Code & EEPROMNext PostRange Rover P38 Blower Module Servicing and Repair – Part 2, The control module, dismantling and replacing switching transistors.